They’d been planning for years, practicing for months, and then the day arrived: June 29, 2008, when UCLA Medical Center would move across the street from its half-century-old Center for the Health Sciences into the new Ronald Reagan UCLA Medical Center. "Moving into a new hospital is like orchestrating a symphony," says Richard Azar, head of transition planning. "It is crucial that everything be perfectly coordinated," with the goal, first and foremost, to ensure patient safety and to provide seamless continuity of care before, during and after the move. 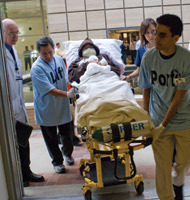 Part of that planning involved visiting other hospitals that had undertaken similar moves, and based, in part, on those experiences, transition planners were able to determine what would work best for UCLA. There were also mock moves to coordinate and practice their timing. Finally it was time. "This is it. This is our house of healing," Dr. Gerald S. Levey, vice chancellor of UCLA medical sciences and dean of the David Geffen School of Medicine at UCLA, said to a group that had gathered early in the morning in the Edward D. & Anna Mitchell Dining Commons at Ronald Reagan UCLA Medical Center to receive its marching orders. "This is your home." He recounted the long and often-difficult road that had been traveled to reach this time and place. It had been "a challenging project," he said, recalling the 14-plus years of planning and construction that went into making the new hospital a reality. "We've had obstacles. We've had times when we didn't know if we could finish the project. Cherish it. Love it. Take good care of the patients. Thank you so much for everything that you do. And thank you for making this day possible." Here are scenes from the day. "It's going to go fine," said "wayfinder" Chris - a volunteer wearing a white T-shirt with a prominent black "?" who would help point the way through unfamiliar hallways - to another wayfinder, Tom. "It's a great thing ... an event you don't want to miss." "I think that's why we all volunteered for this," responded Tom. "This will never happen again." "OK," a move leader called out. "Can I get a show of hands for the blue team? And for the gold team? Remain calm. We're all here to help each other. Let's have a good day." At 4 a.m., Westwood Plaza and several surrounding streets were closed to public traffic. 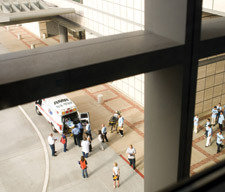 Thirty minutes later, sheets of cardboard that had covered the exterior signs at Ronald Reagan UCLA Medical Center were removed, and at 5 a.m. the emergency department at the "old" UCLA Medical Center closed forever - ambulances were diverted to other hospitals for the duration of the move - as the new EDED across the street opened its doors. "It is our pleasure to open the David I. Saperstein Emergency Center at Ronald Reagan UCLA Medical Center, Mattel Children's Hospital and Resnick Neuropsychiatric Hospital," said Amir Rubin, CECEO of the medical center, as he cut a blue ribbon to signify the event. "We are open for business. Welcome!" A crescent moon still hung in the sky when the move began before daybreak with patients from Stewart and Lynda Resnick Neuropsychiatric Hospital at UCLA. "Things are moving along like clockwork," noted Dr. Thomas B. Strouse, medical director of Resnick Neuropsychiatric Hospital. His patients had been very excited about the prospect of participating in the move. "We even had a couple of people who didn't want to be discharged late last week because they wanted to stick around for it," he said. Then, at 7 a.m., the teams started moving pediatric and adult medical and surgical patients - and all their medical support equipment - carefully transferring them to gurneys to be taken to a fleet of waiting ambulances. In what really did, in many respects, resemble a precise military maneuver, one patient was moved from his or her room every two minutes. The 30 ambulances drove along predetermined routes to deliver patients to the new hospital - in most cases 15 minutes from bed to bed. As the ambulances arrived, their doors would be flung open, and waiting hands of porters and lifters would grasp the gurneys bearing patients, gently lowering them to the ground to take them to their new rooms. After each person was moved to a bed, a three-person "pit crew" in green latex gloves and face masks stripped the linens off the gurney, wiped it clean with disinfectant, put new linens on and rolled the gurney away for another trip. One hospital executive was heard to comment that he had never seen the gurneys so clean. Pediatric patients had priority. An ambulance with 11-year-old Miranda Beck and her mother, Lisa Beck, pulled away from the old medical center at 7:08 a.m. for the short trip to Ronald Reagan UCLA Medical Center. Bundled in a UCLA sweatshirt, the hood pulled over her head to keep her warm and an antiseptic mask covering her mouth, Miranda's eyes popped wide open as the gurney turned the corner into her new room. "Wow!" she exclaimed. "It's so pretty!" "You're the very first person in this bed," said Mattel Physician-in-Chief Dr. Edward R.B. McCabe. "We've been looking forward to this for a long time," said Chelsea Hoffman, Miranda's nurse. "It will be great, especially for patients like Miranda. We're all really happy about it." Jane Boubelik, chief legal counsel for UCLA medical sciences, who volunteered as a wayfinder, was assigned to a post at the Reagan entrance. "Welcome to Ronald Reagan UCLA Medical Center," she said to each arriving patient. "It's been tremendous," she said between patients. "It's a momentous day. I wanted to be here to see it all." The red team was responsible for moving critically ill patients. 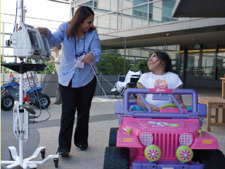 They also moved 22 neonatal-intensive-care infants to the new NICU - infants who had to be moved in special "transport isolettes" that would keep their hypersensitive body temperatures stable. NICICU physician Dr. Marianne Anderson stood in the sunlight of a nearby window as she settled a tiny infant into his tiny bed. "Is this place different? Oh, very much so," she said. "It's bright. It's big. It's beautiful." Two days before the move, Carlos Garcia, 18, had a kidney transplant. He arrived in his new room with his mother, Julia Garcia, who'd spent the previous nights in a chair beside his bed at the old hospital. His nurse showed them around the new room. "You have your own shower. And" - she pointed to Julia and then to a convertible sitting area beside the window - "you can sleep in this bed!" It was anticipated that it would take until 3 p.m. to complete the move. But at 12:40 p.m., Dr. James B. Atkinson, senior medical director of transition, made an announcement over the public address at Ronald Reagan UCLA Medical Center: "The last patient has been moved in! Ronald Reagan UCLA Medical Center is officially open. Welcome." The hospital lobby echoed with the cheers and applause of staff and volunteers. in labor. We have a liver transplant and a kidney transplant that will probably take place sometime later today, and an appendectomy in the ED." Said Dr. Atkinson, "This building is alive. It's really a great feeling that finally we're home." Judy Lin is a senior writer for UCLA Marketing and Communications and UCLA Magazine. Freelance writer Jeanne Wright contributed to this article.